The star of the Thanksgiving table was revered by the Maya. Turkeys these days are mostly seen as vessels for stuffing on your Thanksgiving table. But in 300 B.C., the birds were viewed by the Maya as vessels of the gods and honored accordingly. In fact, the birds were originally domesticated to play a part in religious rites. Prized players in Maya religion and culture, they were once coveted symbols of power and prestige. Turkeys are everywhere in Maya archaeology and iconography. The ancient Maya had one of the most advanced civilizations in the world, and part of their culture was a love of turkey. The bird “was conceived of…as being gifted with exceptional powers, which could be harmful to human from the nocturnal and dream space,” explain Maya specialists Ana Luisa Izquierdo y de la Cueva and María Elena Vega Villalobos. Turkeys are portrayed as godlike figures in Maya religious imagery, and at least one Maya ruler included the word for turkey in his royal nickname. 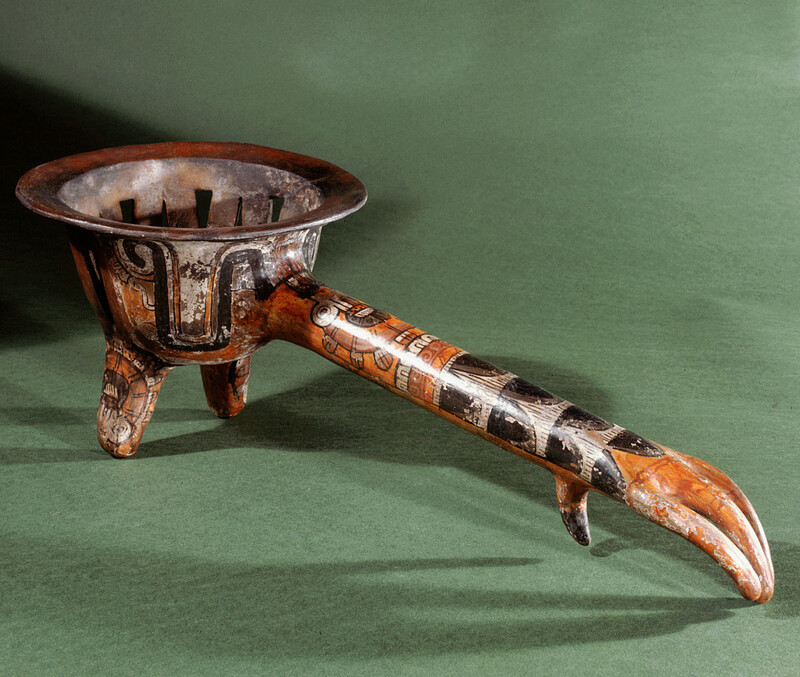 An Aztec incense burner, the handle in the form of Tezcatlipoca, the turkey claw. 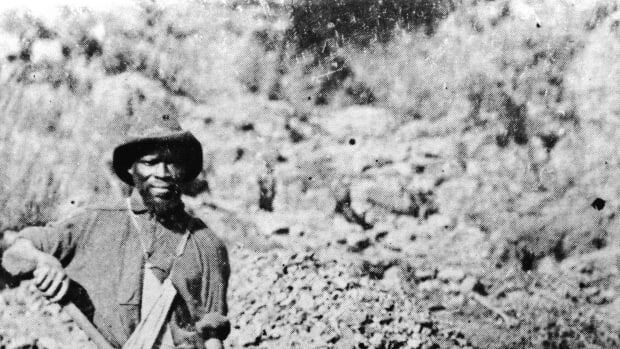 “These early birds were owned almost exclusively by the rich and powerful,” says Kitty Emery, associate curator of environmental archaeology at the Florida Museum of Natural History. In 2012, Emery was part of a team of researchers who published a paper uncovering evidence of the world’s earliest turkey domestication. Her team found traces of non-native turkeys in El Mirador, an ancient Maya settlement that was once home to up to 200,000 people. Residents of El Mirador, in what is now Guatemala, worshiped in massive pyramid-like temples and lived a life assisted by astonishingly modern aqueducts and roads. 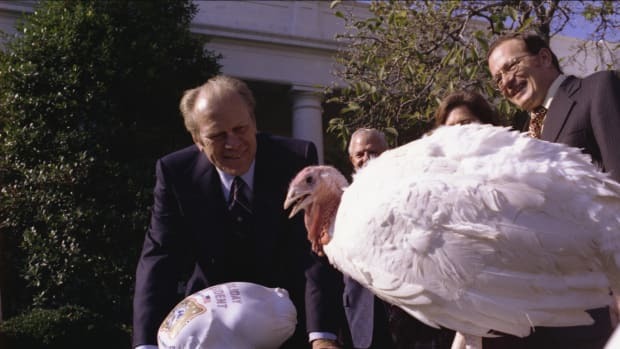 But they also did something else: eat—and worship—turkeys. 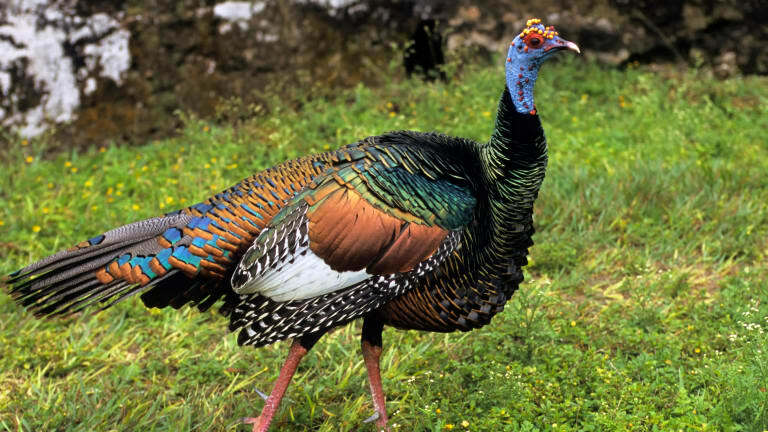 Though the Maya imported turkeys from Mexico, they also prized the ocellated turkey, the wild turkey that roamed the area around El Mirador. Those birds were valued for their multi-colored feathers and heads, but they never made it to domestication. If they had proved tamable, the star of our modern Thanksgiving dinners might have been a lot more ostentatious looking. The power of the turkey was also expressed in religious rituals. Maya art portrays turkeys with slit throats being used in New Year rites. Bird sacrifices, anthropologists hypothesize, were meant to set the stage for a fertile new year, and turkeys were seen as stand-ins and messengers of the gods. 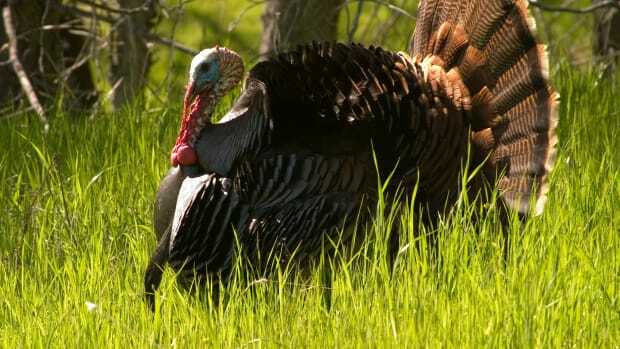 The Maya may not have been able to tame the local wild turkeys, but they used both northern and local ocellated turkeys in their social and religious lives. Today’s modern turkeys are descendants of those prized Maya birds. 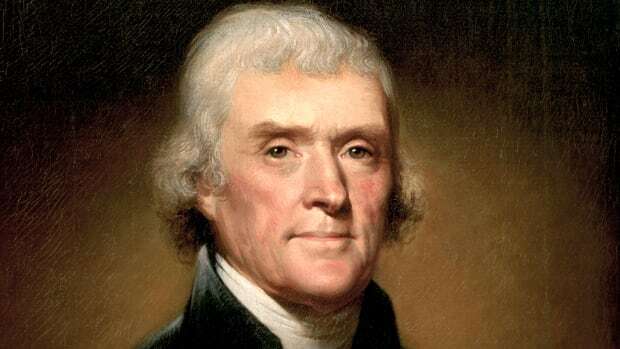 And even though modern Americans’ form of turkey worship includes roasting and eating them during Thanksgiving dinners, they carry a more dignified history in their DNA.